AMHH believes all children should have the proper supplies to go back to school prepared! Having the proper tools for school is essential to academic success. However, for many families of school-aged children in SWFL, education comes second due to greater family needs such as food and utilities. Fortunately, A Mom's Helping Hand recognizes that in order to break the cycle of poverty and hunger, children must be prepared to learn and succeed in school. Additionally, statistics show that children who are academically prepared have higher self-confidence, self-worth and pride, which in turn, results in better grades. 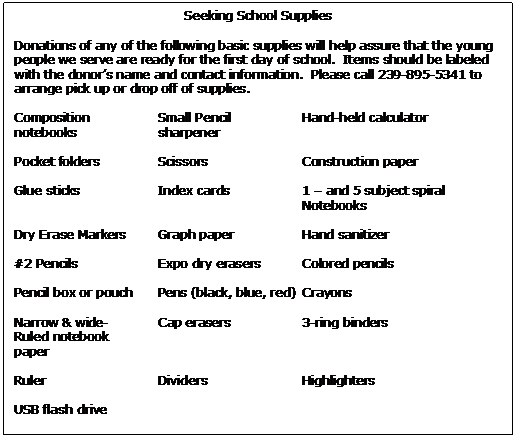 The School Supply Program serves students in K - 12 whose families are unable to purchase needed supplies. Each year, Our outreach collects or purchases new back-packs, pencils, notebooks, pens, paper, rulers and other supplies for distribution. Children receive school supplies either directly from AMHH or through our partnership with local businesses that understand the importance of academic success for our children. To learn more about the school supply program, contact Kristen Peterson at amhh@comcast.net or 239-895-5341. Those in need of school supplies click here for more information on qualifications and to pre-register. If you wish to donate new school supplies, you can deliver supplies to AMHH office, Record Health Chiropractic or Title Junction or make a monetary donation to A Mom's Helping Hand and designate "school supply program". Your gift will make a difference! Attention highly competitive people who think they really know Cape Coral. From 1:30 to 4:40 p.m. July 21, up to 50 teams will use their best detective skills to participate in the second annual Seek in the City Scavenger Hunt, which is put on by A Mom’s Helping Hand of SWFL. Teams of five people may register at https://www.amomshelpinghandofswfl.com/seek-in-the-city.html for a fee of $40. Proceeds will be used to help send students back to school prepared this school year, which helps children from low-income families succeed in school when they have the proper tools. Form an office team and compete against other real estate offices. Prove your team knows the most about the Cape! Clues can include fun facts or details about anything from restaurants and shops to the local art scene. Registration will increase to $50 the day of the event so be sure to send your registration form in early. Our mission is to raise funds for a great cause in a fun way while helping businesses in the community and this is a great way to do it. Assembling teams can also be a complex mission. This is a great team-building activity and getting more companies and their employees involved. We have some great prizes donated by our area businesses and will have a special trophy for the real estate office that beats out their competitors! All the fun starts at Right Choice Realty, Cape Coral Branch located at 1213 SE 47th Ter. August 10th is the first day of school in Lee County. Summer vacation will be gone in the blink of an eye and it will be time for the daily school routine again. Early alarm clocks, backpacks packed and homework begin. A Mom’s Helping Hand wants to make sure the children are prepared with the essential tools they need for the classroom and a successful school year. However, we need YOUR help provide these things – school supplies, uniforms, and clothing. This is our 4th year helping to send children back to school prepared. Each year the number of students we serve increases. Each year we coordinate a School Supplies Collection and each year you, our generous donors, come through to lend a hand for our children. Thank you for that! We truly could not fulfill our mission without you. This year we are asking for your support once again. When children have the proper materials, we can help them strive for the best. We serve children from Kindergarten to their senior year! That is a tall order but with your help, one we know we can fulfill. We appreciate your support of the children at AMHH. 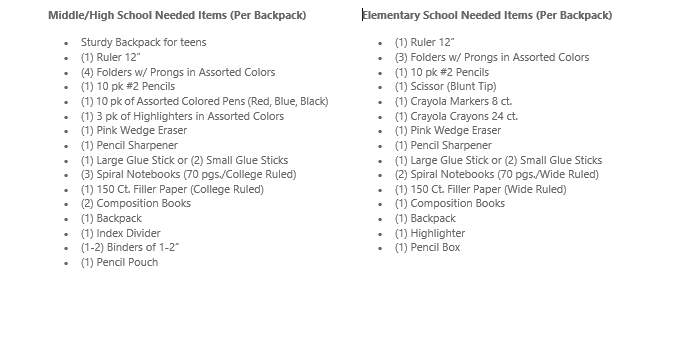 If you would like to partner with AMHH and be a drop off location, you can download the School Supply Tool Kit below. 3440 Marinatown Lane, Suite 201. Simple Math – $2,160 buys 36 children school supplies and backpacks. To make a donation, please use the Donation button on our website. A Mom’s Helping Hand of SWFL. Cape Coral, FL April 30, 2018 -The Flamingo Fundraiser is fun and an attention-getter as a fundraiser. People can donate to have a small or large flock of flamingos roost on someone’s yard. Then those people can donate to have the flock moved to another yard and so on. We start this Saturday, May 12th just in time for Mother’s Day and will go through Saturday, July. 21st. There will be Flock Insurance to purchase for $10 to keep the flock away from your yard. If people want to donate more, of course they can. This is an annual fundraiser to help us provide school supplies to ensure children return to school prepared! In addition, if anyone is interested, we are working on funding to move to a bigger space. We have a building in mind that would be perfect for us and would allow us to continue the services we provide. We are in need of $9,600 to make the move. Whoever would like to donate can go to our website and either register for the fundraiser; or donate to our expansion project. If you’ve walked in to any store recently, you may have noticed that Christmas decorations, trees, lights and all the trim have already started making their way to the shelves and floors. It’s been an ongoing trend that Christmas preparations seem to start earlier and earlier each year. This is the perfect time to start thinking about local families that might need a bit of extra help this festive season. That’s where A Mom’s Helping Hand of SWFL comes in. The organization organizes a family adoption each year at Christmas time for single mother families who are struggling in some way. It could be through financial hardship or just getting by and Christmas is just not possible, often through no fault of their own. The families are carefully screened and partake in a support group program on a regular basis. These families can use a bit of extra support this Christmas, and people can ‘adopt’ a family, putting together a festive package for them to lighten the load a little this Christmas. We have several supporters that sign up for a family every year. Some are very blessed and want to make Christmas a little brighter for a struggling family while others tell us they’ve been where these families are and now that things have changed for them they would like to give back and help and pay it forward. While these families are different in many ways, they have one thing in common. They have all told us how much they enjoyed taking part in our SWFL Santa’s program. While only a few of the families have been added, all the families are expected to be added by October 20th. The items should be unwrapped so the parents can share in the fun too. Some families have special wrapping paper and others just want to feel a part of the process. The donation deadline is December 9th. Hello AMHH Supporters!We hope everyone is recovering from Hurricane Irma and had little or no damage! Our hearts and prayers are with those that have damage or still dealing with the effects. We are very thankful to be part of a wonderful community that has come together after such a horrible tragedy. It’s that time of year, we are gearing up for our SWFL Santa’s holiday program. Please consider getting your work-place, school, church, Scouts, or even Bunko group involved. The success of this program will take a village, a lot of pre-planning and patient coordination. If interested you will be able to communicate the size of the family you would like to be paired with. Then AMHH will pair our families with community members and groups in mid October. At that time you will be given a brief bio and wish list from the family. We tell them they may not get everything on their list, but you never know…! For more information or to arrange for delivery of Christmas Gifts, call Kristen, 239-895-5341. 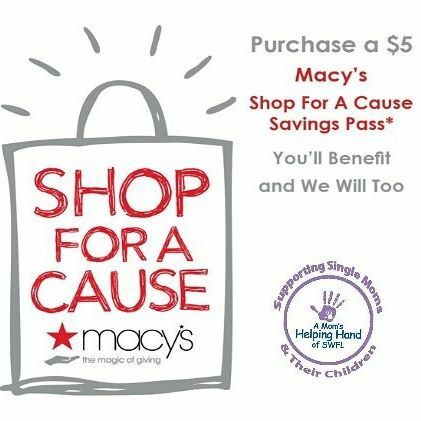 We're really excited to let you know that we're a part of the Macy's Shop for a Cause Charity Challenge. It's a friendly fundraising campaign launched by Macy's where local charities across the country compete to raise the most money with the top teams winning grand prize cash donations. It starts on July 11th at 12pm ET and a total of $300,000 will be given away to organizations in the Challenge. We're ready to raise as much money as we can so we can win the $100,000 grand prize donation. If for some reason you can't fundraise for our campaign, we'll reach out when the Challenge launches to ask you to give to our cause. Every donation makes a difference, no matter how big or small. During June and July, A Mom’s Helping Hand of SWFL is conducting a school supply drive. Every child deserves to have the best educational opportunities possible, but many lack the tools needed to succeed. In 2016, the average family spent $103.94 on school supplies for students in grades K-12. Low-income single parents, who already lack discretionary income, are faced with the decision between buying school supplies or using the money to pay the power bill or rent, or to put food on the table. Our goal is to provide children of single parents with the supplies they need to allow them to succeed this school year. We need your help to make our annual school supply collection a success. You can help by donating school supplies from June 15th – July 22nd and/or by making a monetary donation. School supplies will be used to help students of single parents. Make checks payable to A Mom’s Helping Hand of SWFL - B2SB written in the Memo Line. Help us to support our AMHH Kids by participating in our School Supply Drive. Get your friends, family and co-workers involved. Contact us for drop off locations or if you would like to partner with us as a drop off location.